This week I'll be ripping into another box of 08/09 Upper Deck Series 1 hockey. I went for a box of this in Retail Review #48 a little over a month ago. That box was decent, but didn't have the prize card I was looking for - a Steven Stamkos Young Gun. Will this box yield that high dollar card? I'll just have to open it to find out! I've been opening up a lot of Upper Deck Series 1 and 2 products recently! But that's a good thing because they always have something to look forward to. They are solid products that provided collectors with good value, especially at the secondary market price! This was definitely an interesting box of 08/09 Upper Deck Series 1. Though the Young Guns were mediocre, I did pull a decent amount of insert cards - more than expected. First, the Young Guns: Robbie Earl and Jared Ross. Who? I have to say that before today I had never heard of either of them. Usually at least one of the Young Guns makes the top three cards. That doesn't happen today. In total I was able to pull five inserts (plus the two Young Guns) from the twelve blaster packs. That's pretty good to me. 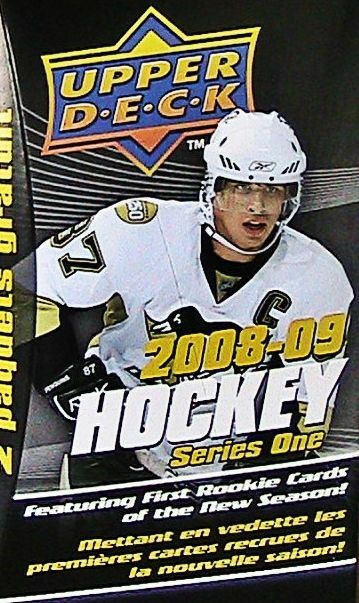 In 2008, Upper Deck was still focusing on single player Hockey Heroes, and that year was of Sidney Crosby. I ended up with two Sid the Kids. I also pulled two All World Team cards, a Sophomore Sensation, and a Hat Trick Hero. The Sophomore Sensation of Marc Staal that came out was the first time I had gotten one of these types of inserts. It's nice to have a set dedicated to the second year of a player; there are a few, but not a whole lot of them. As usual with Upper Deck, the photography was amazing to see yet again. In choosing my top three, I wanted to put in a base card to represent the great photography. It came down to two. The one that didn't make the cut, but does have a sweet photo is card number 169 of Jarome Iginla. That is a perfect shot of him celebrating a goal. You'll see the one that edged out Jarome right now. 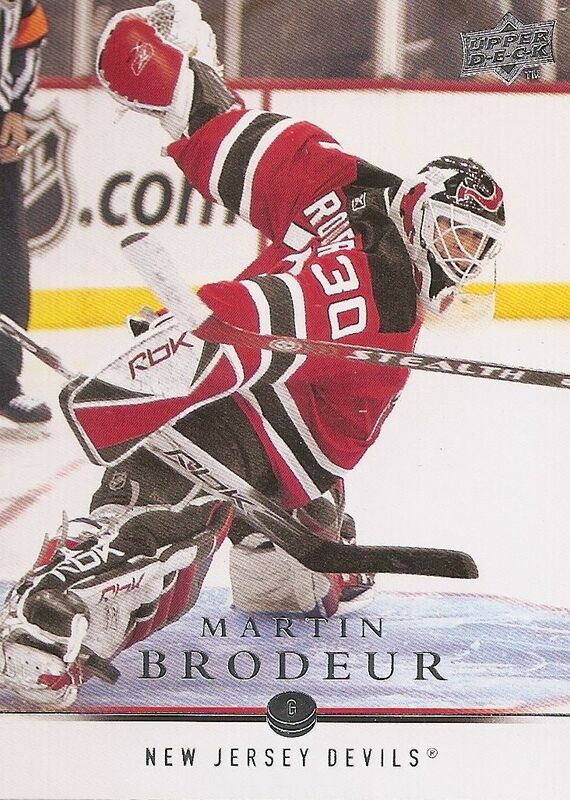 This action shot of Martin Brodeur is just awesome. There is so much going on in the photograph, and the tight cropping of it is perfect. I just love looking at this card, and it really caught my eye as I was flipping through the break. Selanne is a legendary NHLer, but like the Brodeur above, I actually picked this card because of the photograph. 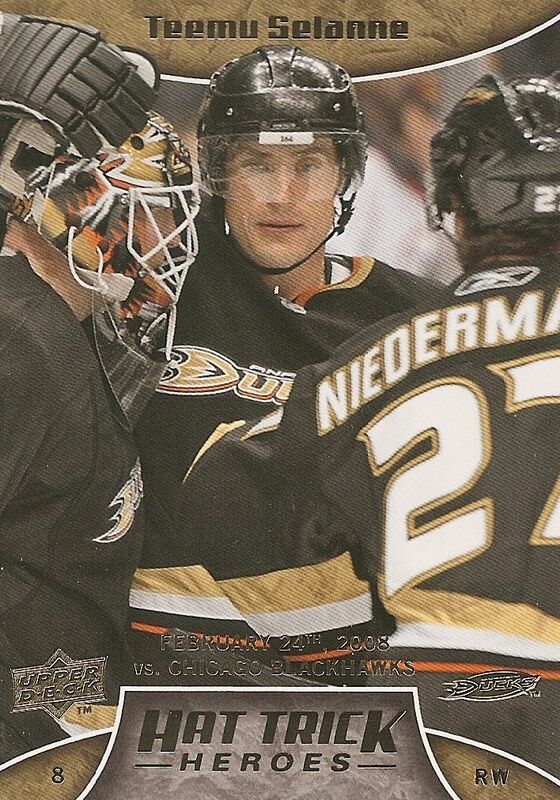 This card captures a perfect moment with Selanne sandwiched between his teammates. He's looking right into the camera as well. Great shot! This All World Team card of Ovechkin was probably the best card of the break. Ovi has had an up and down last few years, but he definitely was on the upswing at the end of this past season. I was really hoping for better Young Guns out of this box, but getting all those inserts made up for it a bit here. It's hard to expect too much out of retail blaster boxes, but this one delivered a solid amount of content. If I were a casual collector buying this box, I think I'd be happy with the cards within. Let me know what you thought of my 08/09 Upper Deck Series 1 blaster in the comment section below. Have you ever pulled anything good out of one of these? I'd love to hear about it. When you emailed Panini what email did you us?